In the decades that followed, the Church of Jesus Christ of Latter-day Saints calcified its abstemious stance on alcohol. The marriage between the state's predominant religion and its alcohol laws cannot be overlooked. With the LDS church weighing in on alcohol regulation, lawmakers are left to try to strike a balance between free enterprise, public safety, the desires of their constituents and, in some cases, their next bishop interview. Before Utah was granted statehood in 1896, breweries in the territory were churning out beer. As highlighted in a beer timeline City Weekly published in 2011, two establishments—Beach & Blair and City Brewing—opened shop in 1850. 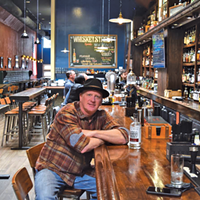 That same decade, a segment of Salt Lake City's Main Street, due to bountiful libations, was nicknamed Whiskey Street, according to a post on High West Distillery's website. Around the time Utah voted (1919) to ratify the 19th Amendment ushering in Prohibition, the LDS church-owned Deseret News opined it would be the "greatest blessing we have known since Christ," noted estimable historian Allan Kent Powell. As was the case in all corners of the country, bootlegging and a robust black market emerged in the Beehive State. The country repealed the 1920 constitutional amendment thereby ending 13 years of Prohibition. 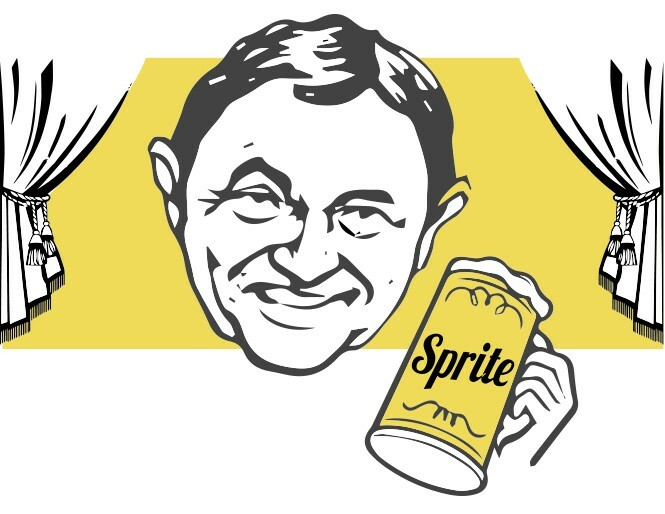 Though not Utah-specific, this historical do-over serves as a useful reminder that appeasing teetotalers by passing restrictive liquor laws today might look regressive and ill-advised tomorrow. Soon after America decided alcohol was copacetic again, Utah established the Department of Alcoholic Beverage Control, the body that continues to oversee alcohol in the state to this day. On the DABC website, it notes that the Legislature "mandated that the department be operated as a public business using sound management principles and practices." While an argument could be made that it doesn't make a lot of business sense to force closure on Sundays, liquor stores recorded more than $405 million in sales in 2016, so they must be doing something right. 2002: No, guys, we're normal. We promise! The whole world was watching in 2002 as the finest winter-game athletes converged on Salt Lake City for the Winter Olympics. When visitors learned of Utah's peculiar laws and realized the party might be dry, they complained. Not to worry, officials helped visitors skirt their own private club laws, then boasted that Salt Lake had plenty of spots to grab a drink, as then-Gov. Mike Levitt did to Time magazine in an article titled "The New Utah." The line of thinking went like this: When minors see bartenders prepare cocktails, so enticed they'll be, that they'll try to order a drink for themselves or something. Guided by that logic, the stage was set for the LDS-supported Zion Curtain law. New restaurants, which were forced to erect a barrier obscuring customers from the bars, sought change in the years after its passage, but it remained in place for the next eight years. Its proposed replacement—an option for a Zion Moat or mini-wall—is not seen by most restaurants as a total fix but instead an improvement. As of press time, Gov. 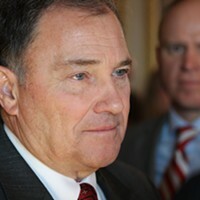 Gary Herbert has a few weeks to decide whether he will sign a bill to lower the DUI limit to .05. 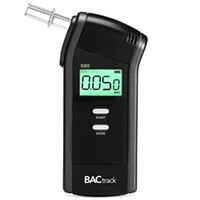 Assuming he does, Utah will be the first state in the nation to set the blood-alcohol bar below a now-countrywide standard of .08. Lawmakers who support the measure, however, believe the rest of the nation will follow and Utah will be viewed as a pioneer, not an outlier. On the other hand, opponents say it won't affect intoxicated driving, but will harm tourism and become the quagmire—à la Zion Curtain—future lawmakers are tasked with repealing. 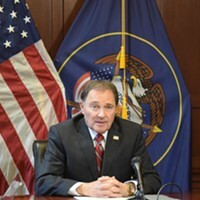 Herbert said this during his monthly press conference on Thursday, March 23: "I intend to sign HB155 with some caveats." Cheers? 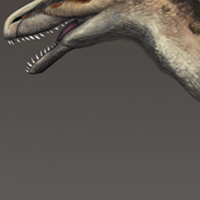 Finally, the Utahraptor gets the respect it deserves. Guv talks controversial DUI bill and more during impromptu press conference.